Like Hollywood legends Audrey Hepburn and Katharine Hepburn, dark energy and dark matter are completely unrelated, even though they share a name. Dark energy, a force that makes the universe expand faster and faster all the time, is called dark because it's mysterious. Nobody knows what it is. Dark matter, on the other hand, a type of matter that outweighs ordinary stars and galaxies 5 to 1, is called dark because it's utterly invisible. We know it's there because its gravity yanks galaxies and stars around, but it neither emits nor reflects any light. Both darks are a big deal in astronomy. The accelerating universe, the first evidence that dark energy exists, earned three physicists the Nobel Prize just a few weeks ago. But dark matter has somehow failed to impress the Nobel committee, even though the idea has been around a lot longer. In the 1930s, astronomer Fritz Zwicky first suggested that given how fast galaxies whip around in space, they ought to fly apart  and would, if there wasn't some invisible matter holding them gravitationally together. In the 1970s, physicists Vera Rubin and Kent Ford came in with stronger evidence for the existence of dark matter, but their work too was received with shrugs. Over time, however, dark matter has become an accepted part of modern astronomy  and now that it is, a new study, soon to be published in the Astrophysical Journal, is calling some of the fundamental assumptions about it into question. The conventional wisdom since the early 1990s has been that dark matter consists of giant clouds of still undiscovered subatomic objects known as weakly interacting massive particles, or WIMPs (an example of astronomer humor that will undoubtedly appeal to fans of The Big Bang Theory). Recently, astronomer Matt Walker of the Harvard-Smithsonian Center for Astrophysics and a colleague undertook a study of two dwarf galaxies hovering on the edges of the Milky Way, looking for new clues to the behavior of WIMPs  and came away questioning whether the particles were there at all. "Our results," Walker says, "pose a real challenge to cold dark matter. I think it's certainly a problem." An important key to the case Walker is making is found in his use of the word cold, which does not mean what most people mean when they say it. In astrophysics, cold particles are those that are born moving slowly relative to the speed of light. Neutrinos, by contrast, are what are known as hot particles, moving at nearly light speed (or, if you believe a much disputed claim made a few weeks ago, even a little faster). Astronomers first thought of neutrinos as a candidate for dark matter  a reasonable choice, since at least we know they exist. But when theorists put neutrinos into their computer simulations, the zippy particles dispersed before they could form clouds of anything. Eventually the field turned its attention to WIMPs. True, they were purely hypothetical, but elementary-particle theory had already suggested that something of the sort might exist. It even explains why WIMPs would be so elusive: weakly interacting means, among other things, that the particles would be unable to reflect or emit light. Best of all, when you put the particles into computer simulations, they condensed readily into clumps, which in turn pulled in clusters of ordinary matter to form stars and galaxies. Bingo! Armed with such a strong circumstantial case for cold dark matter, astrophysicists have been searching for proof of WIMPs ever since and are now trying to create them in the Large Hadron Collider, the huge particle accelerator that straddles the French-Swiss border near Geneva. Walker and Jorge Peñarrubia of the University of Cambridge decided to hunt for more proof of WIMPs by testing one of the particles' behavioral quirks. In theory and in simulations, the clouds of dark-matter particles that surround and pervade visible galaxies should grow denser and denser the closer you get to the center, finally forming a knot, or cusp, of material. But in the real universe, the density  measured by its effect on the rotation of visible stars  increases only to a point, then remains steady the rest of the way in. "The conventional explanation," says Walker, "is that exploding stars in the centers of galaxies stir up the dark matter." The dark matter is, in other words, homogenized. 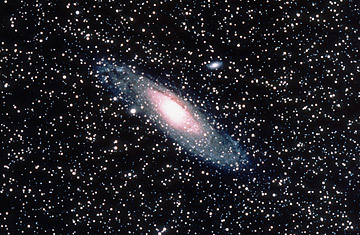 The two researchers chose dwarf galaxies as the place to try to resolve the cusp problem for a very good reason. As a rule, dwarfs appear to have a higher percentage of their mass in dark matter and a lower percentage in stars than spiral galaxies do. With fewer stars, there should be fewer explosions to stir up the dark matter. So dwarf galaxies would presumably exhibit the cusp of dark-matter particles in their centers that spirals lack. The disadvantage: the stars in dwarf galaxies don't move in tidy circular orbits, traveling in the same direction the way stars in spiral galaxies do. Instead, they swarm in random directions like, as Peñarrubia said in a press release, "bees in a beehive." That makes it a lot harder to gauge the density of dark matter as you get closer to the center of the dwarf. But Walker and Peñarrubia figured out a way to do it anyway. It's somewhat complicated  actually, it's crazy complicated  but suffice it to say that when they applied their analysis to thousands of stars in the two dwarf galaxies ... no cusp. And without the exploding stars to explain such cussed cusplessness, the whole notion of cold dark matter could be in trouble. Certainly, the case is not yet closed; there are a lot of ways dark matter could survive the latest findings. Maybe dark-matter particles are neither hot nor cold but warm (or "tepid," as Walker puts it), moving at an intermediate speed through the early universe before forming clouds. If so, any part of the theory downstream from that new premise would have to be reconsidered and the absence of a cusp might be explained. "Tepid dark matter isn't ruled out by our observations," Walker says. "But it's a lot harder to simulate." It is also very unlikely to be created at the Large Hadron Collider and wouldn't be spotted with any of the experiments currently set up to detect it, meaning the entire field of study will have to be recalibrated. The universe, clearly, does not give up its secrets easily  and the Nobel committee is unlikely to be granting a dark-matter prize anytime soon. See photos of the Hubble telescope's greatest hits. See photos of the Large Hadron Collider.